MEDICAL COSTS SINCE JANUARY 2014: $796.17 PLEASE CONSIDER MAKING A DONATION! Victor, aka K Nine Victor, is an almost 12-year-old white and brindle male born on December 11, 2002. His sire is Fortified Power and his dam is Vote Dole. 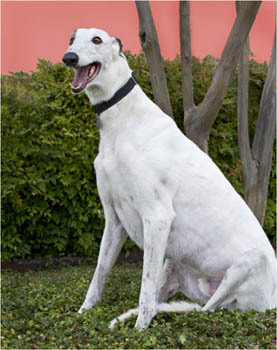 Victor was not registered and so has no races to his credit on Greyhound-data.com. He arrived with a central tarsal bone fracture of his left leg which was evaluated by Dr. Bob Radasch of the Dallas Veterinary Surgical Center. Dr. Radasch determined that Victor's fracture was chronic. X-rays and palpation of the ankle indicated that performing arthrodesis surgery was not warranted at that time. Victor was put in a splint for 10 weeks, and he has now been released by Dr. Radasch! Victor is being treated for corns, and is responding well. He was in a home for almost a year, but has returned to GALT because of serious owner health problems, and no fault of his own. On February 7, 2014, Victor's previously broken left rear ankle and leg began to swell and fill with fluid. X-rays were taken, but did not definitively identify the problem. He was successfully treated for an infection with antibiotics and pain medication, and the swelling and fluid is gone. However, because of the old injury to his leg, this could recur. Victor has tested cat intolerant at this time. 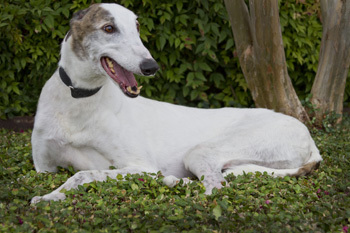 How many greyhounds (or any dog for that matter) do you know that smile? Well, Mr. Victor does! When we walk up to him and baby talk a little he scrunches up his nose. It's the cutest thing you've ever seen! There is not a mean bone in this dog's body. He doesn't care much about having other dogs around, but he's also fine if they're around. He's very laid-back, but he does have his moments where he'll play with us. We only crated him for a couple of weeks--Victor's not one for potty accidents. While Victor may be a little older, you will receive unconditional love in spades when you bring him home. All this sweet boy needs is a comfy place to lounge-- there's nothing high maintenance about him at all. Who wouldn't want to give this fantastic boy a forever home?